After a proof of concept, future iGEM teams may take the system into a variety of fields. Being able to combine bacteria and structure them into layers will mean that we can combine the simplicity of the bacterial genome at the same time as we make more complex structures. This ability may prove useful within many different fields of synthetic biology, ranging from medicine to biocomputing. One of the inspirations for developing our system was biocomputers – devices made of biological material that can perform computational tasks. A biocomputer can have almost any imaginable form, but are extremely likely to require a highly organized hardware – just like regular electronic computers. 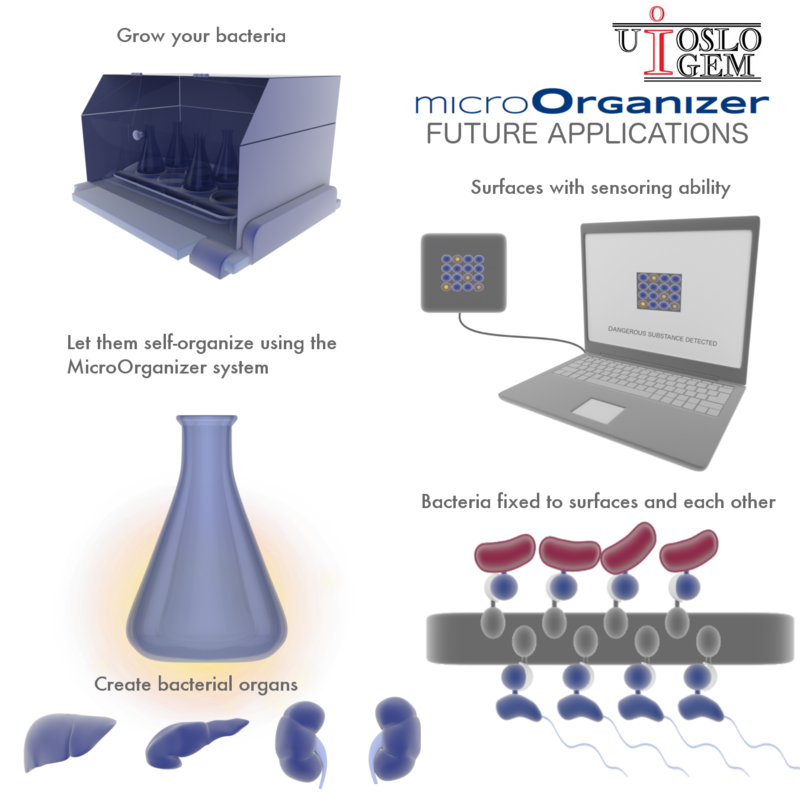 With bacteria as the constitutional part of the a biocomputer system our microOrganizer can be used to organize clumps and cultures with different strains of bacteria into organized structures. Thinking even further one could imagine a even more refined version of our system were bacteria could be build into matrices and other highly organized structures. This is of course far into the future, but the answer to these tasks resides in the field of synthetic biology. Far into the future, bacterial organs based on our system may be possible to construct. By using surface split-enzymes that when connected will generate substrates for induction, differentiation of bacteria is possible based on their binding partner. This is a system analogous to that in multicellular tissue, where protein-protein interactions between cells in part decide cell faith by conducting a signal into the cell. The future bacterial organ may be used as an exterior replacement for a human or animal organ in situations such as hormone deficiencies etc. The principle idea of binding bacteria to a surface by it’s surface proteins can also be used within the material sciences. In principle this means that you can make living surfaces. This can be an advantage if you want to create a renewable surface, or a surface that can react to it’s surroundings. For instance sensors can be made, by adding enzymes that produces colors when the chemical you want to detect is present. Medicine also might benefit from living materials by using bacteria as bioscaffolds for other cells. If bacteria can be attached to a surface, and in addition produce surface specific proteins for human cells, then multipotent stem cells can be induced and this may work as a template for growing tissues. Living materials means that you can have a wall painted with bacteria. You wouldn’t have to paint as your paint would renew itself, perhaps only depending on sunlight.